In Your Life, By Following a Few Simple Rules! Many of us have experimented with the Law of Attraction. We focused on our goals. We visualized. We meditated. We watched 'The Secret' again. We placed our orders with the universe. And we just didn't get the results we were promised. These days, 'manifestation' and the 'Law of Attraction' are turning into cheap, overused buzz words in the world of self-improvement. And that's a shame, because the Law of Attraction can be an incredibly POWERFUL force for change in your life. You just need to use it CORRECTLY. YES - The Law of Attraction Promises It All! - But Why Does It Fail to Deliver So Often? Everybody wants to change their lives in some way. If you could change ANY aspect of your life right now - what would it be? These are the "golden nuggets" promised by teachers of the Law of Attraction. Just figure out what you want, focus on it, and wait for it to come about in your life. But things don't quite work like that - do they? Everybody is teaching something different. 'The Secret' will teach you to keep going at something until you get it. Others will tell you to forget about it and wait until the universe delivers. Nameless "GURUS" continue selling course after course, seminar after seminar - all crammed with further "methods" and "techniques" for manifesting in your life. And none of it really seems to deliver. It's hard to find out the TRUTH about the Law of Attraction when the market feels so shallow and full of hype. And that's precisely why I'm writing to you today. Unveiled: A Course that Outshines the Rest! Law of Attraction. From a Man That Lives It. My name is Bradley Thompson, and I'm a self-development author. For the past 15 years, I've dedicated my life to exploring every nuance of the personal development world. There's not much I haven't tried! I've explored everything from subliminal messages to lucid dreaming. I've created self-improvement courses such as the Power of Breathing, the Ultimate NLP Course, the Secrets of Hypnosis - and more. My business clients include IBM, the US Army, FedEx, the BBC, Merrill Lynch, Time Warner, Intel, Xerox - even Microsoft. I don't say this to impress you. Rather, I say it to impress upon you that I know what I'm talking about when it comes to self-development. I've tried it, I've lived it - and I know what really works. I've studied with some of the greatest personal improvement teachers around. And I've used manifestation to create my own multi-million dollar publishing company. I know what works. And what doesn't. That's why I wanted to create a single course that genuinely teaches the TRUE principles behind the Law of Attraction. I'm talking about a single, FINAL course that shares EVERYTHING - once and for all. No hype. No bull. No crazy promises. No seminars. No extra payments. Just an HONEST, REAL-WORLD GUIDE to the Law of Attraction - and how YOU can use it to achieve powerful, realistic results, goals and desires in YOUR life. This month, I finished writing that course. It's name? 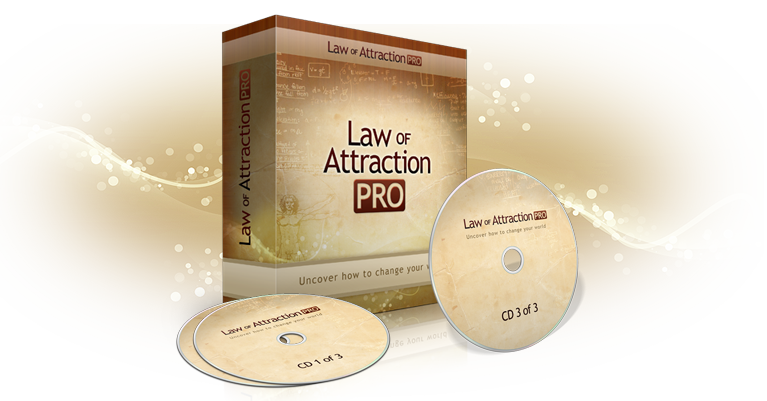 The Law of Attraction Pro.